The Singapore Institute of Technology (SIT) kicks off 2016 with seven new applied degree programmes, comprising a mix of SIT’s own degree programmes and joint degree programmes with overseas university partners. The new applied degree programmes are listed in the table below. More details can be found in infosheet below. All SIT degree programmes will feature the Integrated Work Study Programme (IWSP) as a core component of the curriculum. The IWSP is customised according to industry needs in terms of content and schedule, thus each degree programme boasts an individualised IWSP. It allows students to actively apply theoretical knowledge to solve problems in a real work environment. “As a university of applied learning, we have adopted the approach of integrating learning, industry and community, and ensuring that our degree programmes are industry-focused and tailored to meet manpower demands in Singapore. We want to produce the ‘best-in-class specialists’ who will be catalysts for transformation. To achieve this, our applied degree programmes are designed to prepare and equip students to bring an innovative mind-set to the workplace,” said Professor Loh Han Tong, Provost of SIT.He added, “And with our IWSP, our students are continually learning on the job, consciously applying concepts to real work situations and thinking about improvements. I’m confident that with the IWSP embedded in the curriculum, students will have a better understanding of what full-time employees do and this will prepare them to take on the rigours and challenges of work in the various industries.”The first intake of these new degree programmes will commence classes in September 2016. Classes for the new degree programmes will be located at SIT@Dover, with the exception of BSc (Hons) Nursing classes which will be conducted at SIT@NP Building. SIT’s admission period for AY 2016/2017 is from 11 January to 18 March 2016. Interested students can apply via the SIT website at singaporetech.edu.sg. SIT takes a holistic approach in assessing applicants, taking into consideration academic results, extra-curricular interests and the candidate’s passion and personal qualities. Relevant work experience will also be considered and all shortlisted applicants will be assessed through interviews. SIT’s Open House will be held at Suntec Convention & Exhibition Centre, Level 3 from 16 to 17 January 2016. Prospective students will have the opportunity to speak to lecturers and staff on-site to find out more about SIT’s degree offerings, as well as career services, financial assistance and scholarships available. Various student clubs and societies will also give interested applicants a glimpse of the vibrant student life awaiting them. The Telematics (Intelligent Transportation Systems Engineering) programme will be the first of its kind in Singapore. With the announcement of Singapore’s goal to become the world’s first Smart Nation, this four-year degree programme will pave the way for students to become deep specialists in the relevant areas of vehicle communication and information processing that are much needed in the industry to support this vision. Students will go through rigorous academic training by highly qualified professors while having an eight-month work study stint with established organisations such as LTA, ST Electronics, NCS and MNCs like Continental Automotive Singapore. The Bachelor of Science (Honours) in Occupational Therapy is a four-year programme designed to provide an excellent educational experience in the theory and practice of occupational therapy. It aims to equip graduates with the knowledge, skills and attitude to support the contemporary development and delivery of occupational therapy, meeting the evolving needs of Singapore’s population. As part of the IWSP, students will fulfil more than the required 1,000 hours of clinical practice education across different settings and areas of practice in community and acute hospitals. Radiation therapy involves the use of sophisticated equipment and techniques to deliver radiation precisely and accurately, mainly for the treatment of cancer. The Bachelor of Science (Honours) in Radiation Therapy is a four-year, direct honours degree programme that prepares graduates for the role of a professional radiation therapist. It is the only radiation therapy programme offered by autonomous universities in Singapore. Integration of knowledge and practice is reinforced through real clinical work experience in an actual hospital setting. Students will go through 36 weeks of clinical practice education, gaining experience in radiation therapy for various body regions and systems. Diagnostic radiography involves the use of sophisticated equipment and techniques to produce medical images of the human body, which are typically used to diagnose or treat illness or injury. The Bachelor of Science (Honours) in Diagnostic Radiography is a four-year, direct honours degree programme that prepares graduates for the role of a professional radiographer. 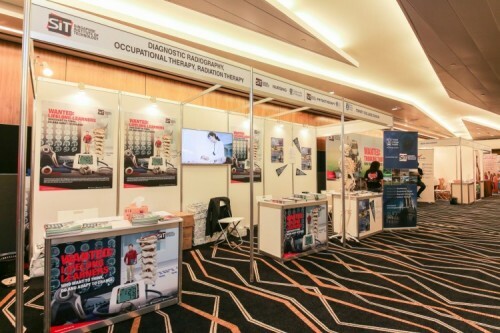 It is the only diagnostic radiography programme offered by autonomous universities in Singapore. The programme includes both general radiography and advanced modalities, including CT and ultrasound. Students will receive 40 weeks of clinical practice education across a wide variety of practice areas including general radiography, ward, trauma and operating theatre radiography, fluoroscopy, angiography and CT. The Bachelor of Science with Honours in Physiotherapy is a joint degree between SIT and Trinity College Dublin (TCD). The four-year programme aims to groom professional physiotherapists who are theoretically-grounded and clinically-oriented to practise independently in different specialties of physiotherapy. Students will have opportunities to gain clinical experience while working in various hospitals and healthcare facilities in Singapore. The clinical practice education consists of 30 weeks of clinical placement in various specialties of physiotherapy in different healthcare settings. The Bachelor of Science with Honours in Nursing is SIT’s first joint degree in partnership with University of Glasgow (UofG). This is a two-year post-registration programme which builds on the foundation that students have established through their nursing diploma studies. The aim of the programme is to develop critical, analytical and innovative skills, as well as leadership, research and clinical competencies. Graduates will be able to translate new nursing knowledge into practice by making evidence-based clinical decisions. Students will go through a six-week clinical practice education, where they will integrate their knowledge and practice in the delivery of patient care in the hospitals and community, as well as a four-week Overseas Immersion Programme (OIP) in Glasgow, United Kingdom. The Bachelor of Food Technology with Honours is a four-year degree programme that offers a curriculum focused on Food Product Technology, combining food science, food engineering and food business. The programme educates and equips students in the fundamentals of food science and applied food technology skills for a career in the food industry. Students will spend 28 continuous weeks of work placement in the food industry under the IWSP. To find out more about SIT, visit singaporetech.edu.sg.